This species is accepted, and its native range is Peninsula Thailand to W. Jawa. High climbing rattan clustering to form rather dense clumps or thickets. 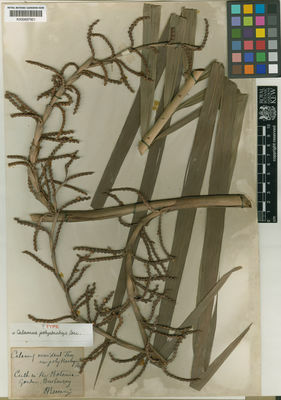 Stems without sheaths 1-2 cm in diameter, with sheaths to 3.5 cm. Internodes about 15 cm often much longer in juvenile stems. Sheaths with conspicuous knee; sheath bright green bearing numerous whorls or partial whorls of fine black horse-hair-like spines, the bases of which united to form green collars encircling the stem, some of the collars upward pointing, others reflexed, at least some collars interlocking in pairs to form galleries usually occupied by ants. Leaves to 2.5 m long with cirrus to 80 cms and petiole 6 cm only on mature stems, longer in juveniles. 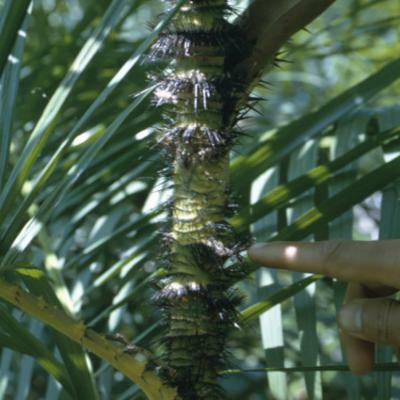 Leaflets about 60 on each side of the rachis bright green, regularly arranged, rather narrow about 30-40 cm long by 1 cm wide, bristly on both surfaces. 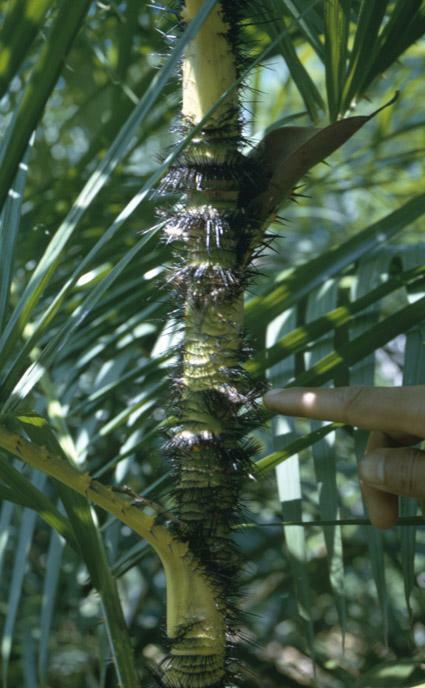 Inflorescence emerging from mouth of leaf sheath, about 50 cm long, without terminal flagellum, with 7-8 partial inflorescences on each side of the axis, the partial inflorescences subtending sparsely spiny or inerm bracts each on subtending 3 flower-bearing branches; male and female flowers both small, distichous. Fruit at maturity ovate not exceeding 6-8 mm in diameter covered in 18 vertical rows of ivory-coloured scales; seed grooved and pitted. Seedling leaf with 4 leaflets. Pahang near Mentakab and Pulau Tioman. Sumatra, Borneo, Java.